A new challenge in Santa Clara, CA! This one is the "Belly Buster Challenge". 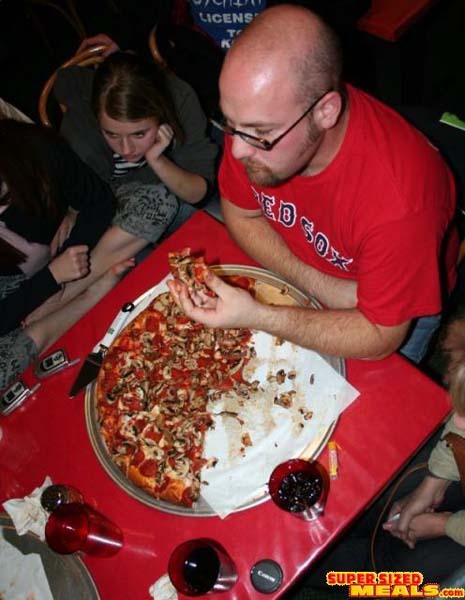 One person has one hour to consume a 20" pizza. It's a hefty looking pizza too! On Saturday, December 2nd at 7:00 PM three friends, Adam, Bear and Cooper decided to give it a shot. They even did up a video of the entire event, showing the pizza being made, and the challenge itself! The Pizza and Pipes Belly Buster challenge was a success. A few men set out to make history, two became boys while one became a legend. What exactly is the Belly Buster challenge you ask. 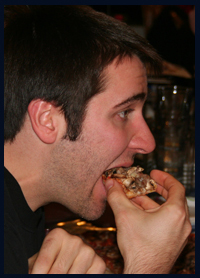 Simple, itâ€™s a 20â€� pizza that must be consumed in one hour or less by one individual. To date many have tried but none have been victorious. The Hall of Shame is filled with Polaroids of individuals whoâ€™ve attempted to conquer the Belly Buster while the Hall of Fame lay bare. 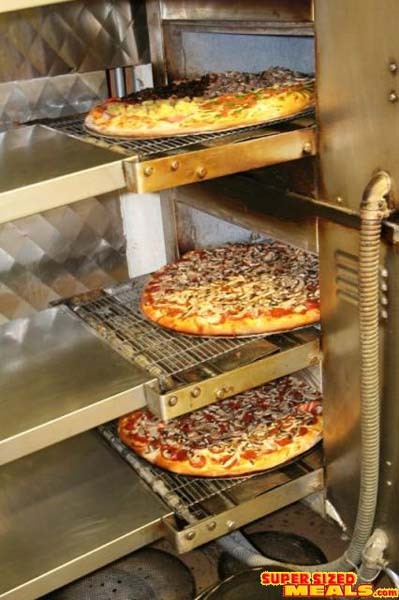 Pizza and Pipes is located at 3581 Homestead road in Santa Clara on the corner of Lawrence Expressway. As you enter, immediately to your right are the official rules. On Saturday, December 2nd at 7:00 PM three friends, Adam, Bear and Cooper decided to give it a shot. Who you ask was the sole victorious challenger? First, who exactly are the competitors? 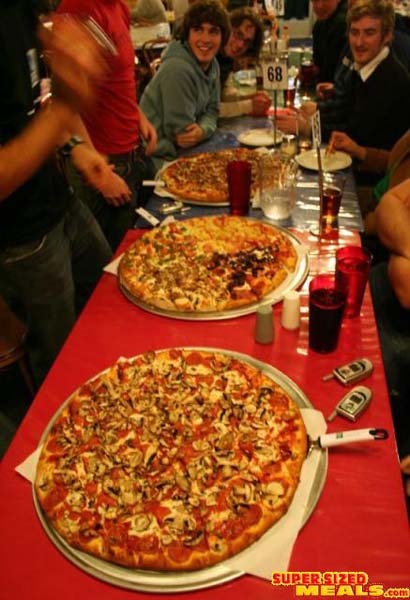 Owner Randy Blair personally prepared the three pizzas. He allowed the contestants to go behind the counter and see how itâ€™s done. He takes two large pizza crusts and rolls them together. Using the old-style technique he then tosses the pizza dough. He punches small holes in it to prevent bubbling of the crust. Next he ladles on the sauce from a 5 gallon bucket. Moving over to the topping station he carefully weighs out 1 pound of cheese and spreads it evenly across. 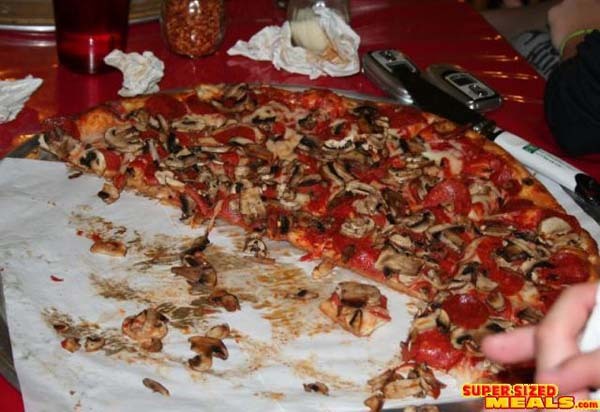 Next came the 100 pepperonis and the mushrooms. 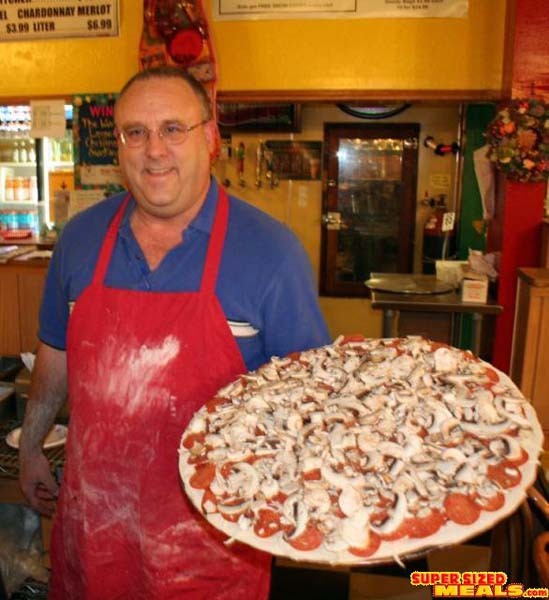 Bearâ€™s pizza was more time consuming and took the skill of a seasoned pizza cook but Randy is a true artisan of his craft and produced a work of art. After 15 minutes or so in the oven we had three beautiful pies. Waiting a short distance away were three starving men. In a glorious procession they were delivered to the tables. The timer was set and at exactly 7:00 PM Pacific time the challenge was on. The first couple of minutes the pace was pretty even. All three contestants ate at a slighting fast clip. At around minute 6 Cooper and Adam slowed their pace a bit with Bear continuing on. At minute 17 Bear reached the halfway point while Cooper went outside to have a smoke break. 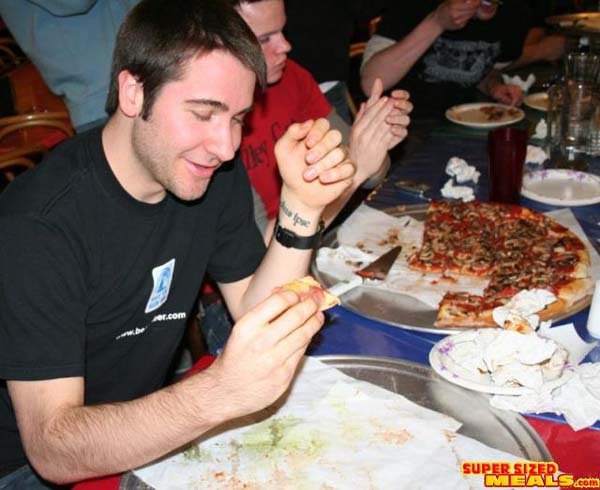 He was however escorted by a Pizza and Pipes staff member to ensure there was no â€œreversal.â€� Adam kept on with a steady pace and steady unflinching face. The four previous challengers all had a similar fate, they started off strong and all looked like they might make it by minute 20 but not much was consumed in the next 40 minutes. The inevitable â€œwallâ€� seems to come around the 20 minute mark. One gave up at 45 minutes, one left 10 pieces, one 8 and one ran out of time with just 4 pieces left. Back from his cigarette Cooper sat down with new vigor. 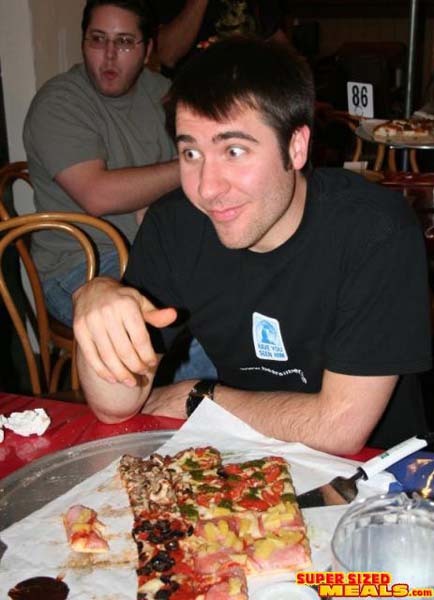 He quickly caught back up to Adam nearing the half pizza mark. Bear was now down to single digits, 9 pieces remaining. 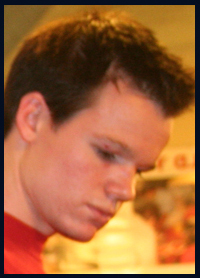 This now put him in third place all-time. 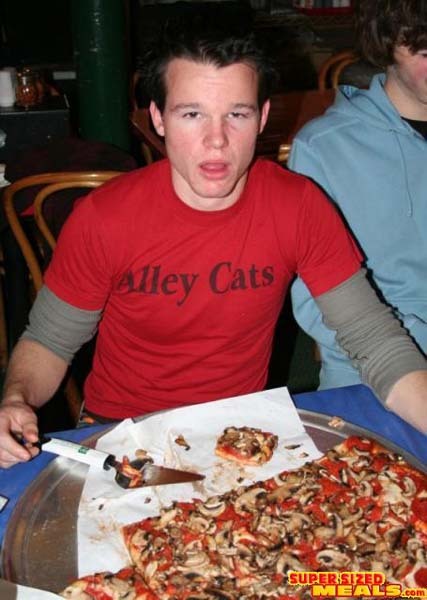 At the 31 minute mark and just about half the pizza remaining Adam called it quits. He had eaten pizza to his stomachs content but would not go on. He was staring at two worthy adversaries and didnâ€™t feel it was worth the expected discomfort. Cooper kept on with a steady pace but also decided to call it quits at minute 33 seeing that Bear was now down to just 4 pieces. Randy promptly brought the Polaroid over to capture the defeated duo and posted their pictures on the Hall of Shame. 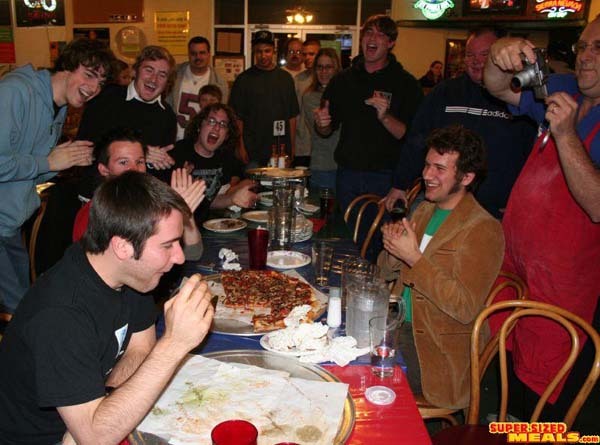 Down to just 3 pieces and currently the furthest along all-time the crowd got rowdy and started chanting â€œBearâ€¦Bearâ€¦Bearâ€� And so it was with 37 minutes elapsed Bear triumphantly finished the last piece while simultaneously becoming a pizza legend. I'll be there this weekend... 20 inches of pizza is nothing. Good job to Bear, but all 3 of them should have accomplished this feat or at least gotten close. Not levt half. I will have my gf take some pictures and get them to you if I complete the task at hand. I am very confident about achieving that feat in the hour time period. I don't know if I can beat the time posted by Bear... 37 minutes is very impressive, but I will try. Well even if you do it you'll still have to beat my time of 37 minutes. I'd love to hear how it goes. Good luck! As a note, Joey Chestnut came in Wednesday and completely dominated me. He finished it in 15 minutes. 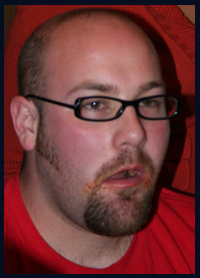 Damn, why'd I have to live in the same city as the #1 American competitive eater?